David O'Leary and Nick Walker both have a love of winemaking, a desire to create something exceptional and a strong affinity with the Australian wine industry. After working for large companies for twenty years and amassing over 300 gold medals and 60 trophies (including a Jimmy Watson and twice International Red Wine Maker of the Year), David and Nick had achieved just about everything that a winemaker could. A new challenge beckoned and David and Nick's belief in their winemaking skills and their confidence in the fruit and the vineyards available to them was the catalyst for them to establish their own venture based in South Australia's picturesque Clare Valley. As with all things in life, a window of opportunity opens only a few times and they believed it was their turn to step up, have a go and return to what winemaking is all about, making great wine from great vineyard sites. David graduated from Roseworthy Agricultural College in 1980. He spent a year in Tasmania working for Heemskerk Wines before joining Chateau Reynella in 1981. 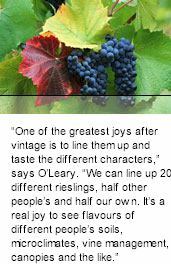 He was appointed group red winemaker for Hardy's in 1990 and held that role until joining Mildara Blass in 1994. At Mildara Blass, he held senior winemaking roles at Quelltaller Estate in the Clare Valley where he launched Annies Lane and at Mildara's Coonawarra winery. During his time with Hardy's and Mildara Blass, he also made wine if France and California. David has achieved considerable in his twenty years of making wine. A Jimmy Watson Trophy in 1988 and twice International Red Winemaker of The Year (1992 and 1994) sit proudly along with numerous other trophies and gold medals. David's goals have never changed, he simply wants to make great wine. Nick graduated from Roseworthy Agricultural College in 1982 and took up residence at Krondorf Wines for the next 16 years. Nick was instrumental in making some of the great Eden Valley Rieslings of the time and had enormous success on the show circuit with his white and red wines. Nick undertook sparkling winemaking duties in 1998/1999 at Yellowglen and was chief winemaker at Yarra Ridge in 2000.